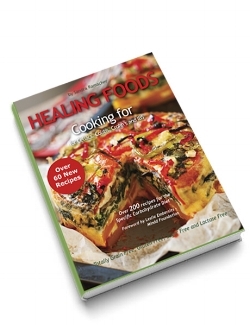 Healing Foods is a cookbook designed for those suffering from digestive disorders such as Crohn's, Colitis, Celiac Disease and IBS. It is a completely Grain-Free, refined Sugar-Free, Starch-Free and Lactose-Free diet based on the Specific Carbohydrate Diet™. SCD™ was developed by Dr. Sydney Haas an expert on Celiac Disease and biochemist Elaine Gottschall and clinically tested for over 50 years with results showing that 75% of those who adhered to the diet rigidly gained significant improvements with many considering themselves cured. The diet is also extensively used in the treatment of children with autism as well as many other auto-imune diseases. For detailed information on the diet please visit the website Breaking The Vicious Cycle. This cookbook is designed to bring good ‘normal’ Specific Carbohydrate Diet™ legal foods to your table with the ease of any other healthy diet. As a matter of fact, in contrast to some of the diets out there, this one is a cinch. It will require some changes in the way you look at food.